Copper-alloy object in the shape of a long, narrow, winged animal, perhaps a dragon. The animal has a straight body with raised neck. The head has a long projecting snout. On the underside of the animal there is one attachment, located towards the front of the body. At the end of the tail there is one rivet. There are two rivet holes on the object, one at the tail end and another in the middle of the animal's body. Helen Geake writes: From the illustration, it seems likely that the 'one attachment' could be an integral spike or peg on the underside of the animal's chest. There seem to be two separate rivets, one at the end of the dragon's wings and one in a rounded lobe at the end of the tail. Just in front of the central rivet hole there appears to be a hole incompletely drilled through from both top and bottom of the object, or perhaps blocked. The animal's head has a transverse hole passing through the mouth, now broken through; and the mouth appears from the drawing to have been made from a short length of rouletted double-triangle stamps, which give the appearance of teeth. 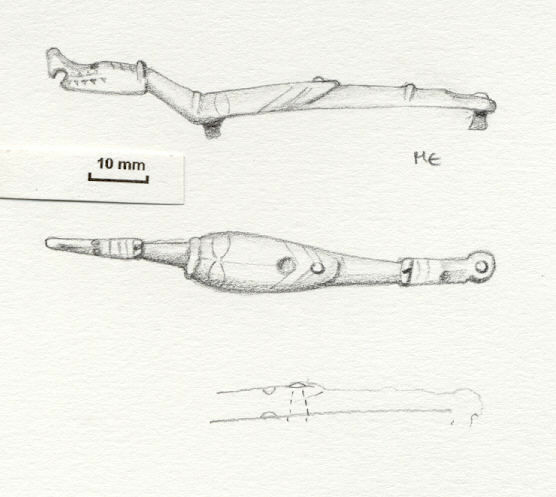 This object can be compared with five close parallels all recorded on the Portable Antiquities Scheme's database. One is also from North Yorkshire (SWYOR-761334) and another was found in Norfolk (NMS-249246). Three further examples, from Suffolk (SF-8E6271), Lincolnshire (LIN-D6F2C2), and an unprovenanced example spotted on eBay (LIN- 4F65C5) have been published together in Medieval Archaeology for 2005, p. 345-6, figs. 7c and 7d. All of these parallels have an integral right-angled blunt-ended spike or peg on the underside towards the front of the body (two in the case of the Suffolk example), plus a hole in the centre of the object, which on SWYOR-761334 holds a separate three-dimensional figurine of a bird. One or two separate rivets towards the tail were presumably used to attach these objects to a base, perhaps the lid of a box. A seventh example, NMS-265275, found in Norfolk, is simpler in design with the remains of the spike or peg only. An object with a similar animal head has been found in Nottinghamshire and recorded on the Portable Antiquities Database as DENO-47F426. The attachment features of this object are, however, somewhat different. The Nottinghamshire example has no drilled holes or integral studs; instead, it has a split and riveted terminal as typically found on Anglo-Saxon and Medieval strap ends. It might be worth also comparing SWYOR-CB2705. Although a stratified parallel has not yet been found, it is likely considering the style of the group that they all belong to the earlier part of the Medieval period. Checked following Sophie Catley. Drawing ref. added.